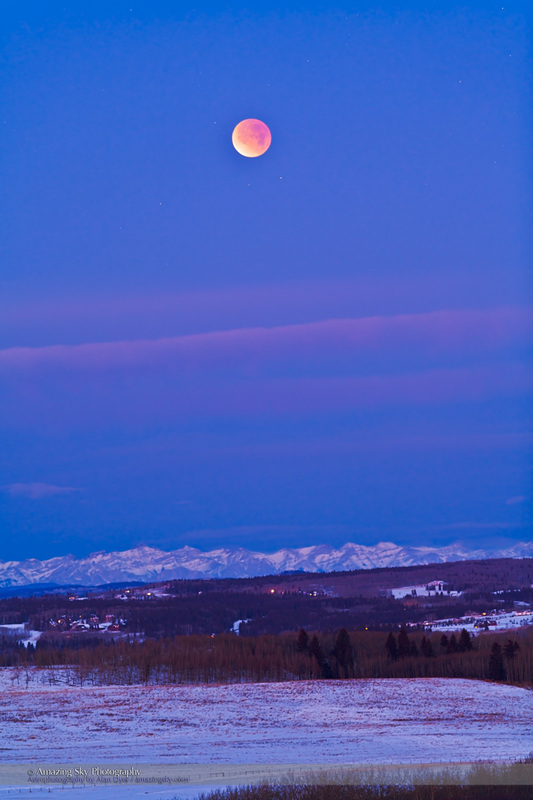 On the morning of April 4 (for North America) the Moon turns bright red in the third of four lunar eclipses in a row. We’ve been enjoying a spate of total lunar eclipses over the last year. We had one a year ago on April 15 and again on October 8, 2014. This weekend, we can enjoy the third lunar eclipse in a year. This Saturday, the Moon undergoes a total eclipse lasting just 4 minutes, making this the shortest total lunar eclipse since the year 1529. Typically, lunar eclipses last 30 to 60 minutes for the total phase, when the Full Moon is completely within Earth’s shadow. • The partial eclipse begins at 4:15 a.m. Mountain Daylight Time on the morning of Saturday, April 4 for North America. 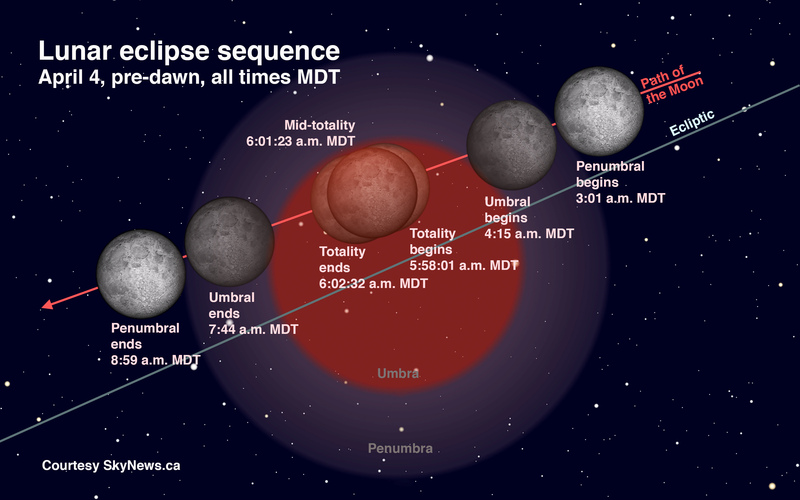 • Totality (when the Moon is reddest and darkest) is from 5:58 to 6:02 a.m. MDT. • The partial eclipse ends at 7:44 a.m. MDT. Add one hour for Central time, and subtract one hour for Pacific time. This lunar eclipse is best from western North America where totality can be seen. From eastern North America, in the grey zones here, the Moon sets while in the initial partial phase and before totality begins. Those in Australia and New Zealand can also see the eclipse, but late on the night of April 4 into April 5. Europe and Africa miss out. Even from western North America, the Moon will be eclipsed while it is setting into the west, and the sky is brightening with dawn twilight, presenting a view such as in the above photo, which I took in December 2011. This eclipse occurs over the Easter and Passover weekend – and actually on Easter for some time zones. The last time we had a total lunar eclipse on Easter Sunday was March 23, 1913. 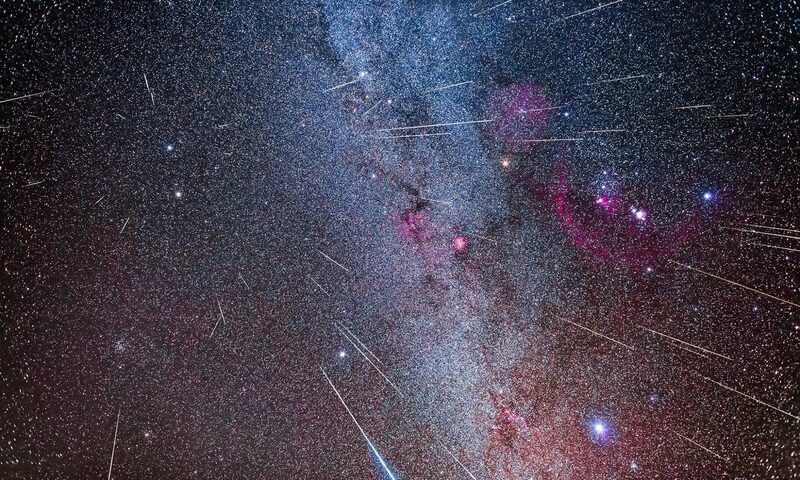 The next to occur on Easter won’t be until April 14, 2340. If you miss this eclipse, you have one more chance this year. 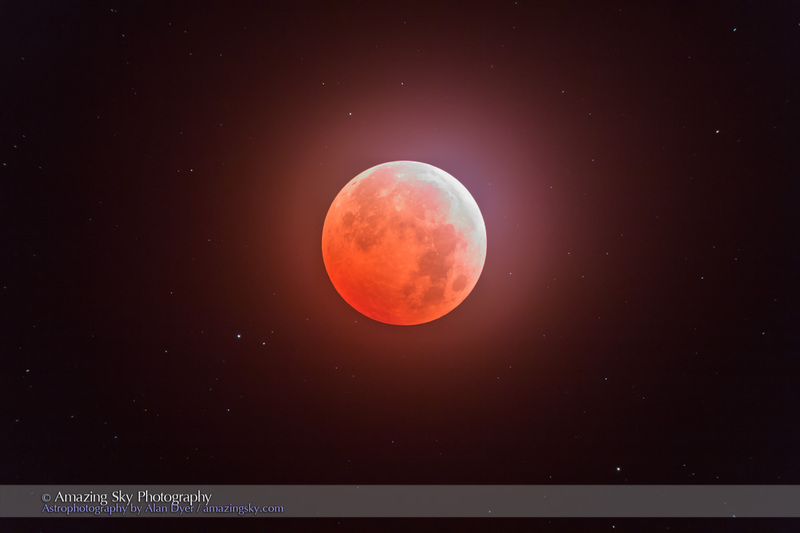 On Sunday, September 27, conveniently timed for the evening in North America, we have the last in a “tetrad” series of four total lunar eclipses. After that, we wait until January 31, 2018. For more details, see the April/May issue of SkyNews magazine.